The widening reach of the ruthless bat-killing disease known as white-nose syndrome has prompted the U.S. Forest Service to reissue an order to close all mines and caves across the South, including those in Pisgah and Nantahala national forests. The closure put into effect this week is meant to slow the spread of the disease, named for a white fungus that appears on the faces, ears, wings and feet of hibernating bats. The disease causes bats to come out of hibernation severely underweight, often starving before the insects, on which they feed, emerge in the spring. It has killed millions of bats in the past six years. The public is prohibited from entering any cave or abandoned mine on national forests in 13 Southern states from Oklahoma to Virginia and Florida for the next year. White-nose syndrome has been confirmed in both forests, which together cover more than 1 million acres and draw more than 5 million visitors a year. Anyone violating the closure order faces a fine up to $5,000, Westcott said. Organizations found entering closed mines or caves can face fines up to $10,000. There is no evidence that the disease affects humans, but there is the potential that humans can transfer the fungus from one cave or mine to another on their footwear, clothing and gear. White-nose syndrome is known to affect six bat species: the little brown, Eastern small-footed, northern longeared, big brown, tri-colored and the Indiana bat, which is a federally endangered species. White-nose syndrome, which has been documented in 18 states and four Canadian provinces, has killed 5.7-6.9 million bats since it was first discovered in 2006 in upstate New York, including almost endangered 25,000 Indiana bats. In North Carolina, the disease has been confirmed in Haywood, Transylvania, Avery, McDowell and Yancey counties, and is suspected in Buncombe, said Gary Peeples, spokesman with the U.S. Fish and Wildlife Service field office in Asheville. The disease was first discovered in Western North Carolina in February 2011, in an old mine in Avery County, and in a cave in Grandfather Mountain, Peeples said. The fungus — Geomyces destructans — is spread from bat to bat as they hibernate in caves and mines, he said. Infected caves and mines may not show obvious signs that the disease is present, Peeples said. “We want to take a conservative approach,” he said of the reason for limiting public access to areas where bats hibernate. WNC’s three endangered bats — the Indiana bat, the gray bat and Virginia big-eared bat — are already facing threats from the public. He said the syndrome has not yet affected the Virginia big eared bat, but the disease continues to spread. “As bats keep dying at this rate, we will see an increase in insect pests,” he said. 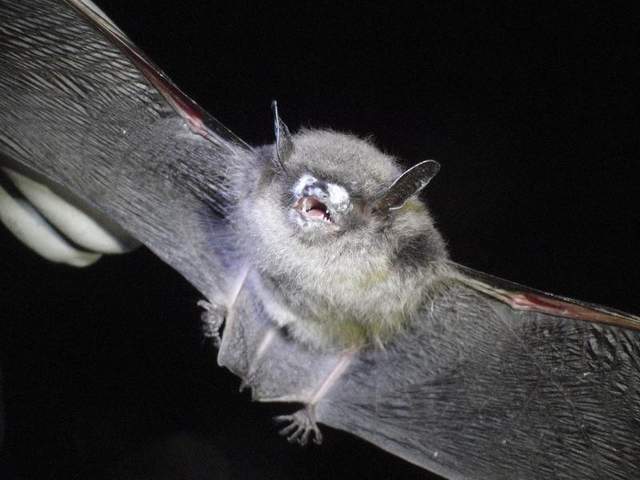 In North Carolina, the wildlife resources commission is enlisting volunteers in a bat monitoring effort to collect valuable information about bat composition and distribution in tracking the spread of the disease. In April, the U.S. Fish and Wildlife Service announced seven grant awards totaling some $1.4 million to continue researching white-nose syndrome in bats, and to identify ways to manage it.